Used in Daniel for Septuagint. Relation to Chigi Manuscript of Septuagint. One of the Greek translators of the Old Testament (see Jew. Encyc. iii. 187, s.v. Bible Translations). He is the supposed author of one of the two extant Greek versions of the Book of Daniel and the apocryphal additions thereto, to a discussion of which the present article is confined. The other version is that of the Septuagint. In Church use the latter has been replaced by the former so effectively that only one manuscript of the Greek Old Testament contains the Septuagint text, viz., the Codex Chisianus, known as Codex 87 (Holmes and Parsons MS. 88), though the translation of the Seventy underlies the Syriac Hexaplar (see Swete, "The Old Testament in Greek," iii., pp. vi., xii. ; he publishes both texts). "The relation of the two extant Greek versions of Daniel is a perplexing problem" (Swete, "Introduction to the Old Testament in Greek," p. 46). The preference for Theodotion goes back to a very early period. 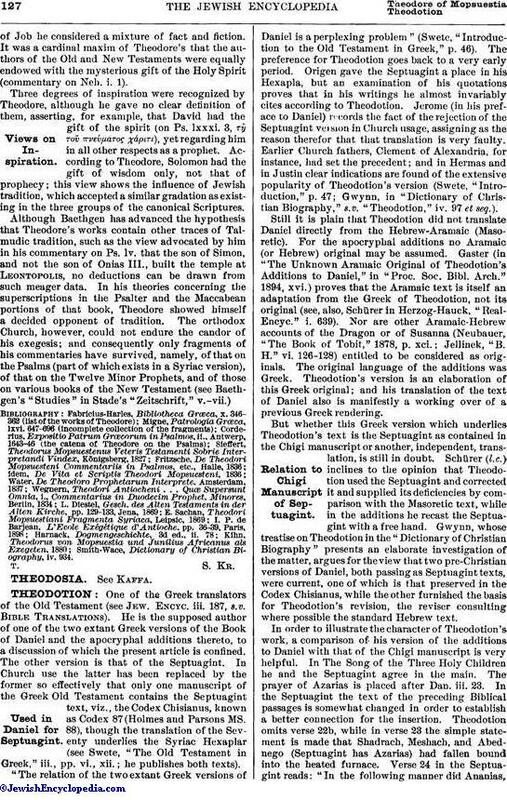 Origen gave the Septuagint a place in his Hexapla, but an examination of his quotations proves that in his writings he almost invariably cites according to Theodotion. Jerome (in his preface to Daniel) records the fact of the rejection of the Septuagint version in Church usage, assigning as the reason therefor that that translation is very faulty. Earlier Church fathers, Clement of Alexandria, for instance, had set the precedent; and in Hermas and in Justin clear indications are found of the extensive popularity of Theodotion's version (Swete, "Introduction," p. 47; Gwynn, in "Dictionary of Christian Biography," s.v. "Theodotion," iv. 97 et seq.). Still it is plain that Theodotion did not translate Daniel directly from the Hebrew-Aramaic (Masoretic). For the apocryphal additions no Aramaic (or Hebrew) original may be assumed. Gaster (in "The Unknown Aramaic Original of Theodotion's Additions to Daniel," in "Proc. Soc. Bibl. Arch." 1894, xvi.) proves that the Aramaic text is itself an adaptation from the Greek of Theodotion, not its original (see, also, Schürer in Herzog-Hauck, "Real-Encyc." i. 639). 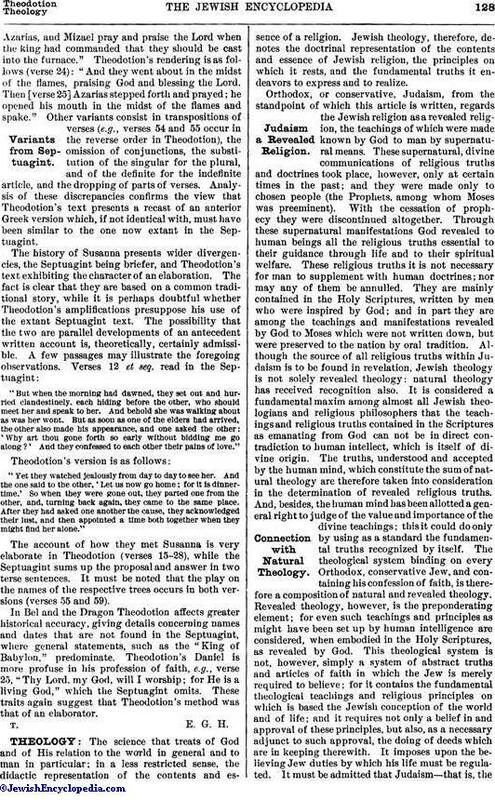 Nor are other Aramaic-Hebrew accounts of the Dragon or of Susanna (Neubauer, "The Book of Tobit," 1878, p. xci. ; Jellinek, "B. H." vi. 126-128) entitled to be considered as originals. The original language of the additions was Greek. Theodotion's version is an elaboration of this Greek original; and his translation of the text of Daniel also is manifestly a working over of a previous Greek rendering. But whether this Greek version which underlies Theodotion's text is the Septuagint as contained in the Chigi manuscript or another, independent, translation, is still in doubt. Schürer (l.c.) inclines to the opinion that Theodotion used the Septuagint and corrected it and supplied its deficiencies by comparison with the Masoretic text, while in the additions he recast the Septuagint with a free hand. Gwynn, whose treatise on Theodotion in the "Dictionary of Christian Biography" presents an elaborate investigation of the matter, argues for the view that two pre-Christian versions of Daniel, both passing as Septuagint texts, were current, one of which is that preserved in the Codex Chisianus, while the other furnished the basis for Theodotion's revision, the reviser consulting where possible the standard Hebrew text. In order to illustrate the character of Theodotion's work, a comparison of his version of the additions to Daniel with that of the Chigi manuscript is very helpful. In The Song of the Three Holy Children he and the Septuagint agree in the main. The prayer of Azarias is placed after Dan. iii. 23. In the Septuagint the text of the preceding Biblical passages is somewhat changed in order to establish a better connection for the insertion. Theodotion omits verse 22b, while in verse 23 the simple statement is made that Shadrach, Meshach, and Abednego (Septuagint has Azarias) had fallen bound into the heated furnace. Verse 24 in the Septuagint reads: "In the following manner did Ananias,Azarias, and Mizael pray and praise the Lord when the king had commanded that they should be cast into the furnace." Theodotion's rendering is as follows (verse 24): "And they went about in the midst of the flames, praising God and blessing the Lord. Then [verse 25] Azarias stepped forth and prayed; he opened his mouth in the midst of the flames and spake." Other variants consist in transpositions of verses (e.g., verses 54 and 55 occur in the reverse order in Theodotion), the omission of conjunctions, the substitution of the singular for the plural, and of the definite for the indefinite article, and the dropping of parts of verses. Analysis of these discrepancies confirms the view that Theodotion's text presents a recast of an anterior Greek version which, if not identical with, must have been similar to the one now extant in the Septuagint. "But when the morning had dawned, they set out and hurried clandestinely, each hiding before the other, who should meet her and speak to her. And behold she was walking about as was her wont. But as soon as one of the elders had arrived, the other also made his appearance, and one asked the other: 'Why art thou gone forth so early without bidding me go along?' And they confessed to each other their pains of love." "Yet they watched jealously from day to day to see her. And the one said to the other, 'Let us now go home; for it is dinner-time.' So when they were gone out, they parted one from the other, and, turning back again, they came to the same place. After they had asked one another the cause, they acknowledged their lust, and then appointed a time both together when they might find her alone." The account of how they met Susanna is very elaborate in Theodotion (verses 15-28), while the Septuagint sums up the proposal and answer in two terse sentences. It must be noted that the play on the names of the respective trees occurs in both versions (verses 55 and 59). In Bel and the Dragon Theodotion affects greater historical accuracy, giving details concerning names and dates that are not found in the Septuagint, where general statements, such as the "King of Babylon," predominate. Theodotion's Daniel is more profuse in his profession of faith, e.g., verse 25, "Thy Lord, my God, will I worship; for He is a living God," which the Septuagint omits. These traits again suggest that Theodotion's method was that of an elaborator.